There are two methods normally used for spherical aberration correction at high accelerating voltages in TEM and STEM: i) Using magnetic hexapoles with transfer round lenses  in both TEM and STEM system; ii) Combining four magnetic quadrupoles and at least three octupoles in STEM system  due to its off-axis aberrations. Probe-forming Cs-correctors are also called STEM Cs-correctors. In STEM, there is only a condenser system, which is a lens used to form a fine probe. Sometimes this lens is also called objective lens. The correction of the spherical aberration of the pre-field lens is much cheaper comparing to post-field corrections. The main advantage of such correction is to reduce the beam tails so that a fine beam can be positioned at a specified column of atoms and does not spread its intensity into neighboring columns significantly. This tail spilling is critical for high resolution Z-contrast (HAADF) imaging and EELS analysis. Figure 4263a shows an example of microscopes with the Cs (spherical aberration)-correctors for both probe-and image-forming systems. The image-forming Cs-corrector is mounted between the objective lens and the intermediate lens, and the probe-forming Cs-corrector is between the condenser lens and the condenser mini-lens. The height of each corrector is 25 cm. Figure 4263a. JEM-2200FS TEM/STEM with probe-and image-forming Cs-correctors. Adapted from . 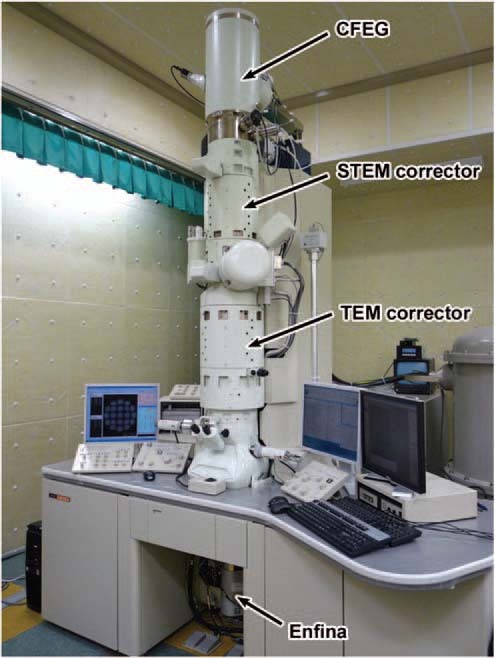 Figure 4263b shows the photograph of a LVEM (low-voltage electron microscope) with delta Cs correctors operated in the range 30 - 60 kV. The CFEG stands for cold field emission gun installed on the top of the column. The delta correctors for STEM and TEM are integrated for both probe- and image-forming systems. An Enfina spectrometer is installed at the bottom of the column for EELS-based measurements. In order to optimize the acquisition of holograms, in many cases, the microscopes need to be re-configured. For instance, Cooper et al. turned off the probe corrector in their FEG FEI Titan microscope even though it had been installed. Both the objective lens and third condenser lens were turned off, and a Lorentz lens was used in order to extend the holographic field of view to 1500 x 700 nm2. David Cooper, Pierrette Rivallin, Jean-Michel Hartmann, Amal Chabli, and Rafal E. Dunin-Borkowski, Extending the detection limit of dopants for focused ion beam prepared semiconductor specimens examined by off-axis electron holography, JOURNAL OF APPLIED PHYSICS 106, 064506 (2009).